I grew up near an Indian reservation in northern Minnesota. The Ojibwa tribe has occupied the area for thousands of years I think. I remember going to PowWows as a kid and having elders come to our schools to tell us about the culture that was truly native to the area. Wild Rice is something that has always been in my diet, I'm a huge fan. It's not really "rice" - It's a grain - and a very healthy one at that. I remember going to a fair somewhere when I was much older, maybe even in middle school and living in Colorado - when I had my first Navajo Taco. Now - I am not even remotely convinced that this food is grounded in native american history. 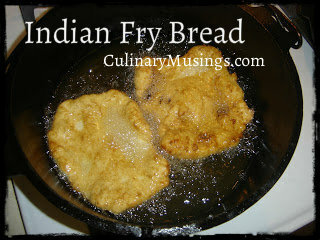 I am convinced that I have had Indian fry bread many times in my life, it was served quite a bit on the reservation in Minnesota. I believe it's existence was created as a byproduct of government food. Flour, Milk and baking powder are the only ingredients - a bit of salt if available. These pillowy pockets of tastyness are great topped with traditional taco toppings, red or green chile, cinnamon and sugar, or honey. They're very easy to make, fry up with amazing quickness - and are a very filling meal. Next time you want a delicious vessel to deliver your favorite chile or taco recipe, try this stovetop or campsite dutch oven Indian fry bread recipe out! turn the bowl over the top of the dough ball and let sit for 5-10 minutes, minimum. I've let mine sit covered like this for up to an hour. remove to a newspaper or paper towel lined platter and serve immediately.